Earlier this week we sent out a letter to our customers letting them know we took a direct hit from Hurricane Florence, survived, and are now back up and running. We lost power, had some roof damage and flooding. Our team had property damage ranging from a few limbs down, to total home loss. Thankfully, though, everyone is safe. We were all very glad to see one another when we returned to work. Custom shirts, custom hats, and all manner of other custom embroidered and printed apparel and accessories are once again rolling off the Queensboro production line. These are a couple of things I thought about as we went from storm watch, to storm, to storm recovery. Over the last couple of years, we have worked very deliberately and thoughtfully on strengthening our overall organization and individual teams by identifying leaders and building leadership skills based on what we call the 4 R’s – Relationships, Relentless, Reflective and Reconnect. Simply put, we believe great leadership requires having meaningful relationships up, down and sideways in any organization. We believe that a great leader is the hardest working person on the team (relentless), that a great leader reflects on all the information they receive before making a decision, and that a great leader is always reconnecting the team, constantly making sure everyone is together. Because of this work, as we prepared for the storm, we had plenty of leaders (you can never have too many leaders)! And as a result, we prepared really well. Our preparation was very quiet. No one made a fuss. No one panicked. We had a couple of short meetings, but everyone pretty much knew what to do. Plans were made at the team level with questions asked when necessary. Everyone helped. No one left the building until their areas were straightened up, covered, and everything was unplugged. The refrigerators were emptied, everything was taken off the floor and the garbage was taken out. I was the last one out. I powered down the servers and disconnected the Internet. As I walked out the door into the silence of the afternoon I felt some pride in the teamwork we displayed preparing, and some trepidation about what was to come. But I did feel prepared, and a bit excited to see what was ahead of us. During the storm we traded stories via Slack, our internal communications channel, about wind, rain and flying trees limbs. All seemed pretty manageable. When we got back to work the following week, many commented on how being connected to the rest of the team while the storm raged really helped calm them down. The storm approached very slowly. Miraculously, just before Florence hit, she unexpectedly slowed from a category three to a category one. This was the equivalent of it going from a major league to a high school fast ball. Florence was still plenty strong and heading right for us, but at least now devastation was not inevitable. When Florence finally hit, the eye of the storm was so huge for a couple of hours we thought the storm was over. We went outside and considering how unexpectedly quiet it had been through the storm thus far (this wasn’t our first hurricane!) we were surprised at how many trees came down but how relatively light the property damage was. Then it started to rain and blow again, pretty much everyone lost power. Reports came in from people sheltering at the office that it was raining inside. Apparently, a large section of the roof over our embroidery floor had peeled back. They did what they could to contain the water, but there was just too much, and it kept coming. Yikes! The “fun” really started when the storm passed. It continued to rain for several days as the storm stalled on top of us. At least the wind had stopped howling. The first step was to get in the building and assess the damage. It was about mid-day when we got in. Welcome to Lake Queensboro! Daylight and rain were streaming in through the ceiling. The power was off, and it was still pretty cloudy outside, so inside it was very dark. Guided by our cell phone flashlights, we began to look around. My first impression was how are we ever going to reopen! We didn’t have any tools, supplies or power. The rain kept coming. We didn’t think there was anything we could do about the roof but decided to go up and take a look anyway. We have a flat, composite roof and when we got up there, we saw shingles, tar and insulation folded back from the corner like a page in a book. From all the roof repairs we had done over the years, we saw about three layers of roof and roofing materials. We had used some sketchy roofers over the years! We saw roofing materials in there that we couldn’t even recognize! Wow. What a mess. Someone said maybe we could flip it back over so at least we had some covering. We went to the edge and tugged a bit. Nothing budged. Feeling the weight of that material, we really sensed the strength of the wind. Imagine a wind so powerful that it was able to pick up an entire section of the roof like that! Each of us were exploring different parts of the peeled back roof’s edge. Everyone was shaking their heads. Then two of us happened to pull on the same edge at the same time. Something moved. Another came over and helped. Then someone else started pulling off some of the loose roofing material making the top covering a little more flexible. Then someone stepped on a nail. I think he was wearing flip flops. “That will probably hurt tomorrow” he said. Pretty soon, working together and coordinating our efforts, we had the roof material moving a little. We got a sense that maybe it was possible to at least get some of the roof covering back in place. This was important because with the storm stalled, we were still expecting a lot more rain. A couple of hours later we were down to the last section of roof. Our hands and shins were all scraped and bleeding. It was still raining. We were exhausted. What was left of the roof just wouldn’t budge. We were pulling and pushing and tugging and cursing but no matter what we did, we just couldn’t get anything to move. Just as we were ready to give up, one more guy showed up and someone said, “Let’s all try to pull at once together”. So we each grabbed an edge of the roof and someone said “One, two, three, GO!” and the last piece of the roof flipped over like a sheet. Wow, what a job! Post roof pull back beer was probably the best one ever. With the roof somewhat covered, and the rain still coming down, the next day – again with no power or ability to get supplies – we started the process of getting the water off the floor. Some who helped with the roof were now flooded in and couldn’t get to the office to help. Some cell phones were now getting spotty service as cell towers faltered. Those who were getting service were having difficulties recharging. And many phones were starting to act up due to all the moisture they had been exposed to. It was getting harder and harder to communicate. But even with failing communications, more people showed up to help. Using whatever we could find, we got to work. We looked a little like a revolutionary war militia with our brooms, dust mops and various other improvised tools. Our outfits were equally creative with all of us doing our best to stay as dry as we could without ruining too many good clothes and shoes. Our first break on the floor project was finding an interior drain in the building. This meant we didn’t have to push all the water outside. Things were looking up! Then we all kind of haphazardly started pushing water towards the drain. The actual drain was about 3 feet below the floor level, so with each little push we’d hear a satisfying little “splash”. We eventually built a couple of water channels using the damaged garments and mistakes we had made the prior week, which we generally collect as a donation for local aid organizations. Soon we figured out a system using a wide dust mop, the one squeegee that we had, and a couple of brooms, to move what felt like large waves of water. When that water hit the drain, what had been a satisfying “splash” became an exultant “flush”. With a particularly good one, a cheer would rise forth. After a few hours, a couple of dry spots appeared. It was great to see we were making progress. It had been an awful lot of water. The next day a few stores opened back up. We were able to get a generator, some more squeegees, and an industrial wet vac. As more folks showed up to help, we finished drying the floor and began the process of addressing all the messages and emails we had received while we were closed. We still had no power or internet at the office, but we had a few evacuees who were able to work remotely, while some of those who stayed scrambled to find a dry place with power and internet where they could log into our order processing system. There were a lot of messages! A few were from customers who knew what was going on and were very understanding, but many had no idea where we were located and that we had just gotten hit by Florence. Some were pretty hot! Wednesday afternoon, a full week after we shut down for the storm, a single light came on in our building. Hallelujah! Later that afternoon all the lights came back on. The next morning our network guy Tom, who had driven through the night with his mother from Albany, got to the office at 6AM to power everything back up. Luckily, other than a few old computers, everything came back up perfectly. A few hours later the phones were ringing, the machines were running, and with about 30% of our folks we were back. The symphony of sounds that is Queensboro was playing once again. It had never sounded so good! As mentioned at the outset, prior to the storm we had been working hard on leadership, communication and teamwork. At the core of our leadership philosophy is a belief that while leading by example is important and effective, it is really the quality of relationships that makes truly great leaders and teams. Developing great relationships is not a simple thing. Before you can even start trying, you need willing and capable people. Putting together such a group is a long and difficult process. There are no short cuts. Only time really proves if someone is a good fit. Fortunately, we had done a lot of that work prior to the storm hitting. For us the storm was a great test on how far we had come and how strong our relationships were. Not to minimize the destruction and stress, the storm was a great team building and team proving experience for us. We knew each other well before the storm but knew each other better afterwards. Supporting each other is an important component of our team philosophy. Due to family or property issues, some of us were less able to pitch in at the office than others. In these cases others immediately filled in. There was no resentment or judgement. Family and safety always come first. But our focus was clear: get through the storm safely, get up and running as soon as possible, and let the customers know what was going on. In hindsight, we underestimated how much damage and disruption the storm could have caused. 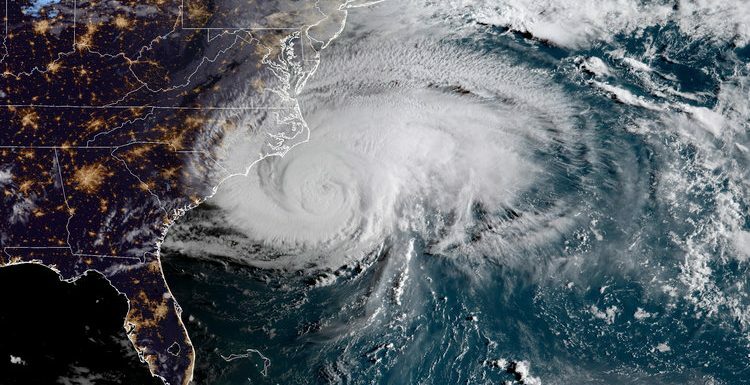 What everyone predicted to be a category three storm at landfall, unexpectedly slowed to a category one just before it hit. That was a huge unexpected bit of luck. With the severity of the storms in recent years and our vulnerable location however, a week or more of a shutdown should have been expected. We planned for a day or two. Next time we will plan for two weeks or more. We are going to establish off site customer service and production capabilities, so we will never be unable to produce orders or answer customer questions for a prolonged period again. Another big lesson reinforced by our experience is that under duress, organization tends to fall apart. This was something we understood and talked about but had never really experience for a prolonged period. We know that it is in times of stress that organization, leadership and teamwork is needed the most, but Florence clearly reinforced that lesson for us. And we saw in real time how the basis for all of this working well was the relationships we had taken the time to nurture in calmer times. When we worked individually, we got stuff done. When we took a little longer to think about what we were doing and worked together to figure out the best way to do things, we got more stuff done. Working together was a lot more enjoyable, satisfying and productive than working individually. Finally, as we go through our days and lives and think we are doing the right things in how we spend our time and energy, it can often be hard to know if we are really working and focusing on the right things. Investing in relationships is one of those things. Taking time to say hi and find out how things are going with our colleagues is always something that is easy to put off in the busy-ness of the day. And for some, working on relationships really is work! If we had any doubts about this, and many of us did to varying degrees, Florence made it clear: few investments will yield a better return than what you put into your relationships with your family, friends and co-workers. One can never be certain exactly when that return will come, but in fact, the payoff really is there every day in the security of knowing when the wind blows, you will note face it alone. In difficult times, either from challenges that we take on, or challenges that take us on, it is going to be the relationships we have invested in and the established channels of constructive communication that we have honed that will allow our team to pull together and perform at extra-ordinary levels. I am glad Florence is gone, but I am also glad for the lessons it taught us.